BZ Flag Game Review - Download and Play Free Version! 3 styles of play: Capture-the-Flag, Rabbit Chase, and Free-for-All. Controlling and aiming your tank is hard to do. Online connection is hard to connect to. Older game has dwindling online community. 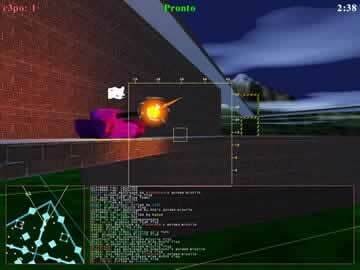 Fight tank battles in a complete 3D environment. Connect to a network of other players online and join a battle. You can then use a host of weapons like guided missles, lasers, shockwave, and machine guns. Don't want to be seen? Use cloaking technology to disguise your presence from enemy tanks. Download and have a blast. Freeware. BZ Flag is a multiplayer tank battle game that will have you competing either online against people from around the world, or through a closed LAN network. The game has three styles of play and competing against others keeps the game exciting and competitive. Not having a single-player mode limits this game, taking it from good to just mediocre. Fans of action shooters might like this game, however, it is not the best in its class by any means. Since this game lacks a single-player mode it puts all its efforts into creating a strong multiplayer mode. The multiplayer setting is divided into 3 styles of play: Capture-the-flag, Rabbit Chase, and Free-for-All. 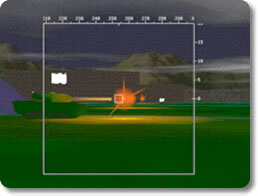 In Free-for-All the object of the game is simply to get the highest score by shooting opponents. There are five teams in each game and destroying another team scores a win, while being destroyed or destroying a teammate scores a loss. Individual scores and aggregate team scores are tallied. The object of Rabbit Chase is to be the player with the highest score so that you can capture all the white flags. Flags come in two varieties, team and super, and hold a lot of importance throughout the game. The final style of play is Capture-the-Flag. In this mode your goal is to capture the enemy flags while preventing your opponents from capturing yours. All five teams have a base in this mode, complete with a flag of their color. To capture an enemy flag you must infiltrate their base and grab the flag. Successfully bringing it back to your base destroys all the players on the captured team and gives your team's score a bonus. You can also take your flag to an enemy base in this game, which counts as a capture for your team if successfully executed. In this, the opposing team is not penalized. As far as gameplay is concerned, BZ Flag ranks on the lower part of the action-shooter spectrum. Your tank is surprisingly difficult to control, and has random buttons. Unlike most action-shooter games that have you controlling movements through the use of the WASD keys and aiming through the mouse, this game has you moving forward and backward with the arrows and side to side with the mouse. The mouse can also be used to move your tank forward and backward so you will probably experience a lot of conflicting movements when trying to master the movements. Not having the mouse control aiming makes it really hard to fire and blow-up your opponent tanks. The movements and controls are really hard to figure out. All in all BZ Flag is just a mediocre game because of its poor gameplay and limited playing modes. If a campaign or single-player mode was available this would certainly be better; however, with the dwindling online population and difficult controls this game is certainly limited. If you are interested player looking for an action-shooter game know that there are better games on the market. However, if the tank action and multiplayer capabilities seem too enticing to pass on, download this free game and give it a try. Catch a glimpse of the awesome gameplay in BZ Flag!